The name of the Friesian breed originates from “Friesland” (“Fryslan” in the Friesian language), one of the eleven provinces of the Kingdom of the Netherlands, situated in the northwest of Europe. It is an old country, with a history dating back to 500 B.C. The Friesian horse was originally imported to North America in the seventeenth century but the breed was totally lost in North America due to crossbreeding. The Friesian was not reintroduced to North America until 1974. There are currently more than 45,000 Friesians registered worldwide in the Dutch Friesch Paarden Stamboek. Approximately 8,000 of those horses are in North America today. At FAIRYTALE FRIESIAN FINDER SERVICE, LLC, we believe that the owner of a Friesian does not have to compromise performance for incredible beauty. Not all Friesians are the same. Some individual horses have the natural ability to be trained to highly competitive levels. We specifically hand-pick Friesians that have the temperament and athletic ability to excel both in the show ring and on the trail. We want you to have a horse that you can relax on, enjoy your ride, and trust to behave exactly as you tell it. When we consider a Friesian as a potential competitor, we choose horses that are proven safe, sane, sound, and have good minds. These are the criteria on which we judge our prospective horses before we decide to import them. Your Friesian is an investment, and we know this. Once you purchase a Friesian from us, you may decide not to compete with him, and perhaps will resell him. Because it came from us, you can be sure that his breeding and training will be reflected in his resale value. All of our horses have deep blue-black coats, lots of feathers, long manes, and thick tails. We do not import horses that have been prone to colic, have EVER been lame, or that have had health problems or issues of any kind. All of our mature horses come with complete pre-purchase exams, including rigorous flexion testing. First and foremost, we look into the eyes of the horse. We ask: Does the horse show a soft, curious look with large, round eyes, or does it have small narrow eyes? Is the horse safe for novice riders, or various riders that do not necessarily have a quiet seat? Is the horse easy to work, does he have excellent ground manners and a sweet, kind, giving nature? Does the horse load, clip, bath, go through water, tie, etc.? Does the horse get along with other horses? Few horses pass this scrutiny. Only those Friesians that do become a part of the FAIRYTALE FRIESIAN FINDER SERVICE, LLC family. We carefully examine every horse and ask: Is the forehand proportionate to the hindquarter? Does the horse have a refined throat latch, long neck, small head, and uphill conformation? Is the leg length proportionate to the body depth? Is the length of the neck proportionate to length of the back? Is the overall bone and substance, such as size of hooves, proportionate to the body mass? We only buy horses with excellent overall conformation, short coupled, and without long backs. We examine every horse, both in its natural movement, and under saddle.For dressage competitors, we look for more natural suspension and extension to the gaits. For saddle seat competitors, we look for more natural knee action. With regard to stride, we ask: Is hock action proportionate to knee action? Do the shoulders move as freely as the knees and hocks (not more or less)? We look for the degree of suspension and animation – more is better. With regard to trot and canter, we ask: In free movement, is the length of the stride from the hindquarter equal to the length of the forehand stride? Does the horse have natural extension in both trot and canter? How freely does the horse move in the canter? Is there a 3-beat canter? 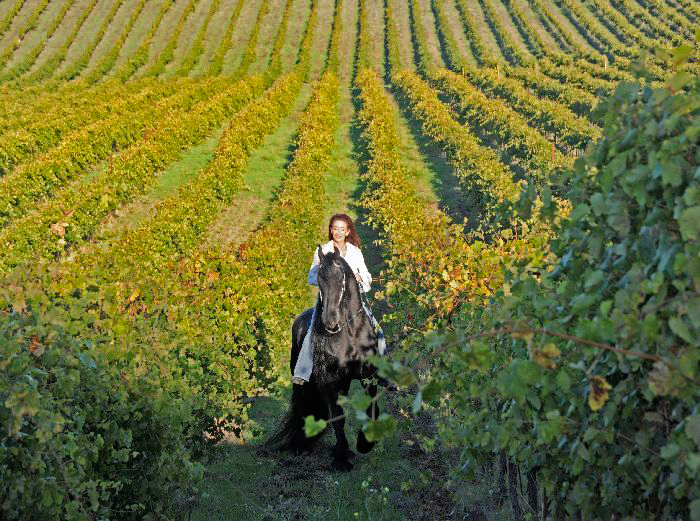 Does the horse have a natural “uphill” forward movement with natural “swing” to his back? With regard to walk, we ask: Is the walk free and loose as opposed to short and tight? ALL of our horses are trained to both ride and drive, and most are suitable for beginners due to our horses’ temperament. The innate intelligence, willingness to work, and the trainability of the breed has allowed Friesian’s as young as four years to score higher than other warmbloods of five or six years in dressage. However, despite the high intelligence of the breed, not all Friesian’s are well suited for dressage. We selectively choose horses that have the conformation, movement, and minds to excel in competition. Dressage movements demand both natural extension and collection. Some Friesian’s are gifted with both, but others lack extension. We look for horses demonstrating both natural extension and collection. 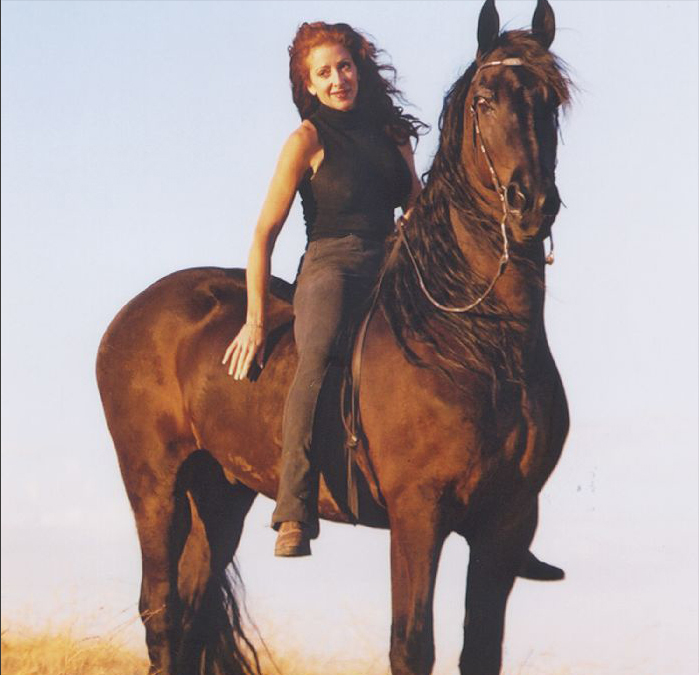 In addition to the Friesian’s natural intelligence, willingness, trainability, and forward motion, they bring a gentle temperament and an uncanny sense of balance to the sport. This speeds up their training and satisfies the owner or rider who wants to see the horse perform well – sooner rather than later. And no other horse looks better than the all-black Friesian with its luxuriant mane and feathers. We import only Friesians who show promise in their suitability for show, AND for trail/pleasure riding. 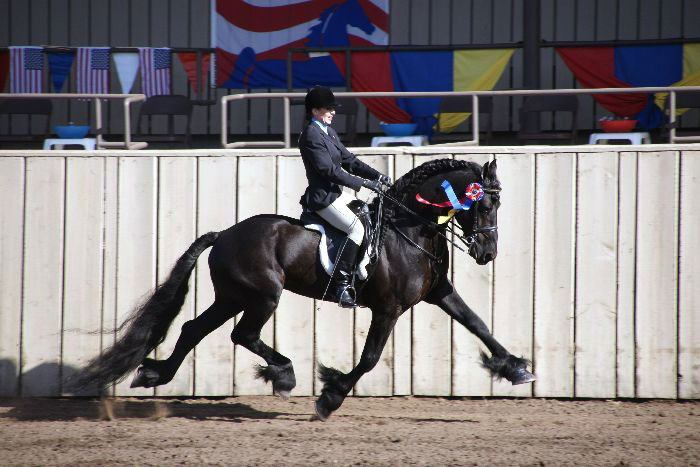 Consider the Friesian as your next dressage or trail mount. 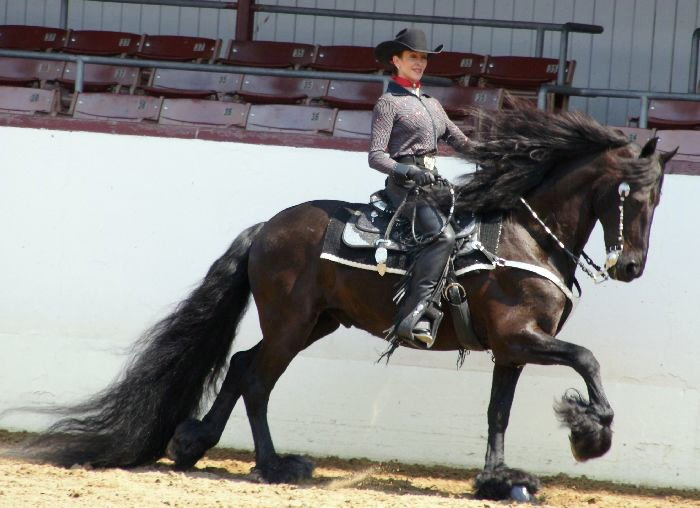 A properly trained Friesian will excite you with its skill and suitability for dressage, show, pleasure riding, and in harness. And as a bonus you will find that it is simply a wonderful family horse.